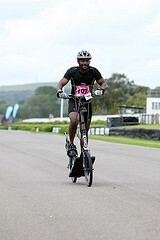 On 24th June 2012 I lined up for Ride-24, the annual Action Medical Research ultra-cycling track challenge held at Goodwood Motor Racing Circuit, in the UK. 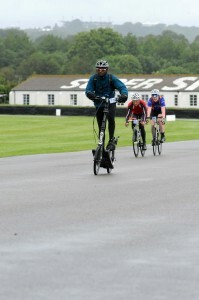 Ride-24 is a 24 hour time-trial which involves cycling round the Goodwood Motor Racing Circuit for a full 24 hours, to see how far each team (or individual) can go within the time limit. About 220 cyclists were taking part in the time trial on standard road racing bikes – most of them as part of teams of 4-8 riders – taking turns to ride across the 24 hour period. 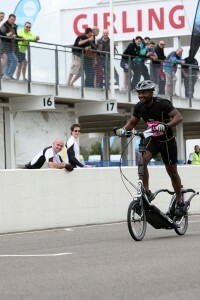 But I was riding the entire 24 hours solo (alongside 33 like-minded individuals) and I was the only one attempting the event on an ElliptiGO. For me it would be an opportunity to set a record for the furthest distance ridden on an ElliptiGO in a single day, which was a great incentive under the horrendous weather conditions I found when I got there. The wind at the airfield and race track was ferocious and bad weather was forecast for the full 24 hours. 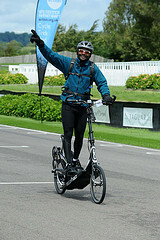 I needed to exceed 202-miles, as that was as far as anyone had ridden before on an ElliptiGO in a single day. I was lucky to get to the starting line just in time. I literally got onto the track with just 25 seconds to spare before the starting horn sounded. So the event started off dramatically enough and I didn’t have any time to get my mind settled – or to arrange my provisions in the pit-lane, before the ride started. 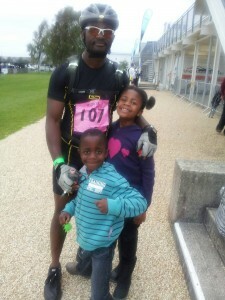 That less-than-ideal situation got me off to a very bad start – tense, dehydrated and well off my plan with the pace. It took me about 3 hours to fully settle down and to properly hydrate – all the while still GOing a little too fast for such a long ride. The conditions were horrible – the worst they’ve ever had at this event, I’m told. The fierce winds raged for the full 24 hours; and it rained for the entire night – heavily. But the wind worried me the most and was the most distracting aspect. I thought it would bring me to a halt, eventually – and that played on my mind a lot. But once I was settled the planned strategy slowly fell into place and a workable routine became obvious. I was riding at a steady 14 mph whenever I was on the track. I was stopping for a 15-25 minute break after every hour of riding. During the breaks my routine was very precise – I’d walk 50 yards to the toilet, then 50 yards to the drinks station for a refill, then 25 yards to the catering tent for 2 bananas, then 20 yards back to the pit-stop area to stretch my leg muscles for 4 minutes (especially the calves), whilst having a Mars Bar and taking my hourly salt tablet to prevent cramping. I fueled on sports drinks, bananas and Mars Bars – exclusively (if it aint broke, why try to fix it)? In total I ate about 40 bananas and 12 Mars Bars. I also took about 30 salt tablets (the bottle says take a maximum of 10 salt tabs in any single day, but I don’t think they are accounting for 24 hour endurance events)! I don’t like pasta very much, so I didn’t experiment with the hot meals available in the event canteen. That’s pretty much it – I just repeated this routine over and over again; for 24 hours. I got through the first 100-miles in 9 hours and 4 minutes and entered ‘unknown territory’ after 115-miles (having never exceeded 115-miles riding distance before this event). Being in ‘uncharted territory’ did bring a level of anxiety, not knowing how my body and mind would respond to the continued effort and sleep deprivation – but that kept me vigilant and focused; and was something of a positive motivator for me. My pace was sustained evenly over the first 18 hours, I’d say. The main changes were that after half way my ‘rolling pace’ – whilst on the move on the track – began to decay gradually (dropping from about 14 mph to about 12 mph – and then even as far down as about 11 mph towards the end of the 24 hour period). The main deviation from plan was a whole wasted hour due to a rear wheel puncture at 163-miles in. That happened soon after a planned break, so I couldn’t use the down time productively like I would during a scheduled break. 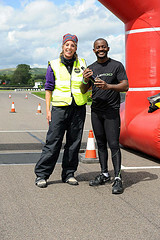 I eventually did 97 laps of the 2.4-mile track – giving 232.8-miles covered in total. That was actually good enough for 15th place overall (in terms of number of laps covered by any individual on the day) and the performance was almost in line with my planned ‘best-case’ scenario of 100 laps of the circuit (or 10-mph overall/average pace across the full event). So under those weather conditions I was more than satisfied with the outcome. I realized at that stage that if the wind and weather conditions had been closer to ‘ideal’ I could probably have squeezed out 250 to 280-miles in total; but under the conditions I was happy ‘just’ to GO over 230-miles. It was a great event atmosphere, as you’d expect with so many serious athletes around. Everyone supported everyone else – and I was given extra special support by everyone there because I was riding a heavier and less efficient machine (requiring probably 50% more effort to get round the track). So even the event organizers gave me a little ‘recognition award’ as a gesture of appreciation at the end! The cheers from the crowd at the beginning and end of each of the 97 laps certainly kept me GOing strong and I noticed in the lap times that my first two and last two laps were the fastest of the whole event. I was unsettled at the start and GOing way too fast but I was elated and relieved at the end and wanted to finish with a flourish! But my job’s done now for the 24 hour standard – and I’m probably not one of those potential Treble Century athletes I’m speaking of here – but they are out there (and I actually know some of them already). I think the Quadruple Century ElliptiGO athlete also exists already – perhaps some of them are already riding ElliptiGOs right now. If you are one of them, or could be, why not consider the possibilities – and help this exciting new sport by breaking new ground and GOing out there and testing your own ultimate limits. Now that I’ve demonstrated that a 24 hour ride is indeed attainable by an average athlete on the ElliptiGO bike – using a rational, Minimalist training approach (6-8 hours of total weekly training were logged whilst preparing for Ride 24) – it makes sense to seek out the longest and toughest road cycling event I can find in the UK, in order to fully validate these concepts once and for all. I have now found an endurance cycling event demonstrably tougher and considerably longer than a 24 hour time-trial, which I will target for 2013 – the London Edinburgh London Audax (usually called LEL). 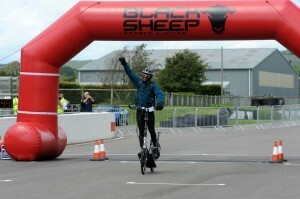 LEL is the longest Audax cycling event in the UK and Europe; held every four years. LEL is about 887-miles (1418 km) long – with a 116 hour and 40 minute time-limit. That gives less than 5 days within which I would need to complete the challenge (which will require 170- to 200-miles to be covered on each of the 5 days). That’s a daily mileage almost as far as I rode at Ride 24! Daunting, I accept – but definitely possible, given enough planning, preparation and determination. If I can complete LEL successfully on the ElliptiGO (having used a Minimalist training approach in preparation) I think my work will pretty much be done – and I’ll have proved all the points which matter to me. I hope that showing such an undertaking is realistically possible will encourage more people to explore their limits on the ElliptiGO and to take on even more imposing endurance cycling challenges. So that’s the plan for 2013. Stay tuned…! 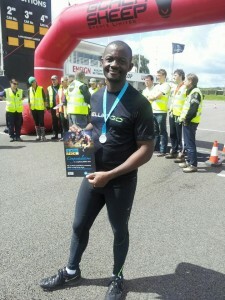 [August 2013 Update: You can now read about Idai’s journey through LEL 2013 on this link].